Living without your teeth can make life difficult. That’s because you’re deprived of such basic functions as comfortably chewing certain foods, speaking properly and smiling with confidence. Thankfully, with the advances in dentistry, you don’t have to continue living like this. Furthermore, you don’t have to settle for the more common method of replacing teeth with dentures. As you read on, you’ll learn about a more durable and effective option – dental implants in San Antonio! The dental implant is a titanium post that is surgically inserted into your jawbone and fuses with the same over a months-long process. This method of teeth replacement differs from any other because it literally gets to the root of the problem. After the implant is placed, your natural tissues and bone enjoin through a process called osseointegration, and you’ll be left with a sturdy foundation that supports your facial structure and allows for a restoration to be successfully attached. Crown – For single missing tooth, the dental crown is the answer. The porcelain fixture attaches to an abutment (a connecting piece), which then enjoins it with your dental implant. Bridge – If you have a series of teeth missing consecutively, your dentist may recommend a bridge, which is a group of prosthetics made into a single, more cost-effective fixture. Implant-Retained Prosthetics – For a single arch or complete tooth loss, your dentist provides implant-retained prosthetics. They attach to strategically placed implants to provide a secure fit and completely remade smile. The common denominator, again, of the above applications is they all rest on dental implants, which provides a level of stability and durability that is unmatched by any other form of tooth replacement. There are some more subtle benefits of having dental implants placed. One area where you’ll see improvement is in your digestion of food. That’s because your implant-supported restorations will allow you to chew your food in a more natural manner. You’ll also notice more confidence, and that doesn’t just make you feel better; it also impacts your immune system and overall health. Having positive thoughts and a more favorable image of yourself cause the production of helpful hormones like endorphins, dopamine and serotonin, which boost your overall health when they saturate the body. 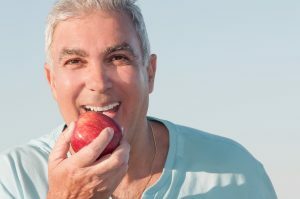 So to get on track with radically improving your oral and overall health with dental implants, contact your dentist in San Antonio to schedule a consultation today! Although he has three decades of experience practicing dentistry, Dr. Troy Jones isn’t slowing down a bit. The University of Texas Health Science Center at San Antonio graduate still enjoys changing lives by providing his patients with the absolute best in dental care. A member of the International Team of Implantology, Dr. Jones puts smiles on faces by successfully placing dental implants at Jones & Knight DDS, and he can be reached for more information through his website.